Butterfield Overland Mail site of Nail's Crossing. 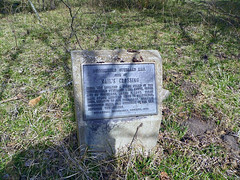 Here was located a stage stand of the Butterfield Overland Mail route, under act of Congress, March 3, 1857. First mail service arrived here in September 1858, enroute to San Francisco, service continued until the outbreak of the War Between the States. Oklahoma Historical Society 1958. Nail's Station was a stage stand on the old Butterfield Overland Mail route and the Texas Road in Indian Territory. Sometimes called Blue River Station or Nail's Crossing, it was located on the east side of Blue River in what is now Bryan County, Oklahoma. It was operated by Joel H. Nail, a member of a prominent Choctaw family. Nail's Station was added to the National Register of Historic Places (#72001059) in 1972. * Description from National Register Properties in Oklahoma, Directions from National Register of Historic Places. GPS from other source, hmdb.org.